Fabric roller blinds, aluminium, shutters, Plise and Duette system are manufactured for Velux roof windows, Fakro, Roto and many others. 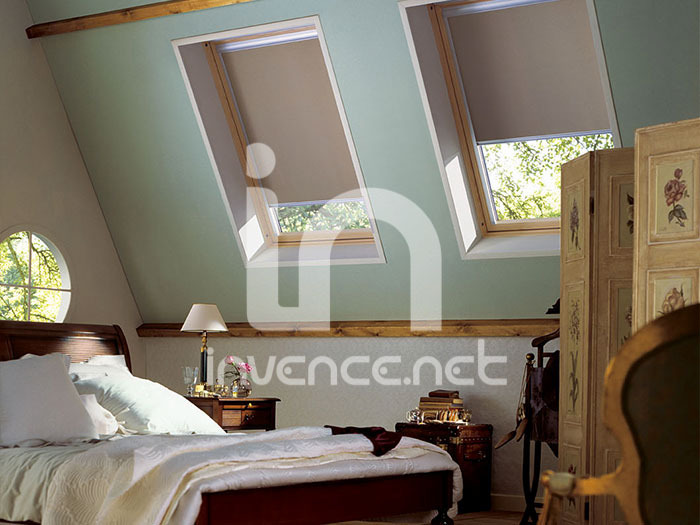 We offer fabric roller blinds with guides that will completely darken the bedroom. 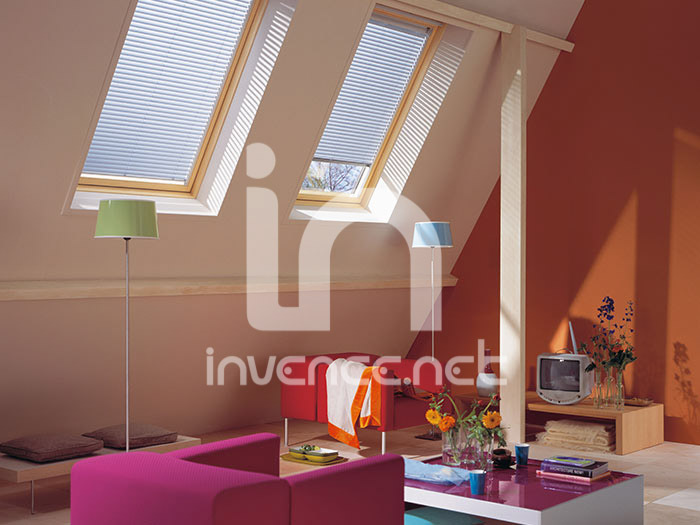 With aluminium shutters to the sunroof window you can smoothly control the transmission of light into the room. Thanks to the huge amount of design substances Plise will easily blend with any type of interior. Using the Duette system provides preventions of the penetration of heat into the room. Of course there is also the option of a motor drive and remote control. Whether you choose any solution, all shutters and blinds for roof windows we can produce tailored made system based on your needs or according to the measurement of our technician. Price of blinds and shutters for roof windows depends on the dimensions (width, height) and the chosen materials. Roller blinds to the sunroof are custom made according to your wishes. The upper cassette and guide rails are made of aluminum. Blind to the sunroof is controlled by pulling the lower profile. We offer several kinds of substances. When using a full blackout substances you can easily darken the interior. Optionally the sunroof can be equipped with the Roman blinds. It can be controlled with its aluminium profiles in several colors to which the material is attached. 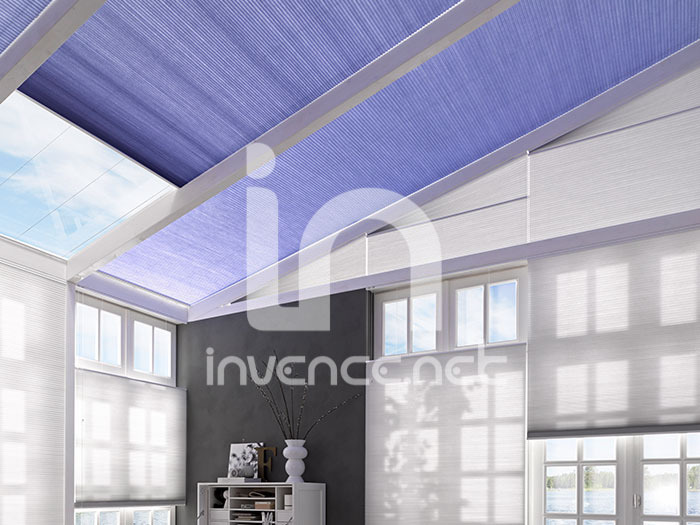 The advantage of roman blinds for sunroofs is that it can be washed in the washing machine. Aluminium shutters to the sunroof are suitable for installation into commonly used types of sunroofs from all manufacturers and of course in any atypical windows. Using this system can easily control the penetration of the light into the room. Slats are smoothly moving by using the knob or slider-bar. Aluminium shutters are controlled by pulling the lower profile. Upper box and side guide rails roof blinds are made of aluminum. We offer many kinds of slats and colors. Swatch of the slats can be seen here. Plise to the sunroof are custom made according to your wishes. 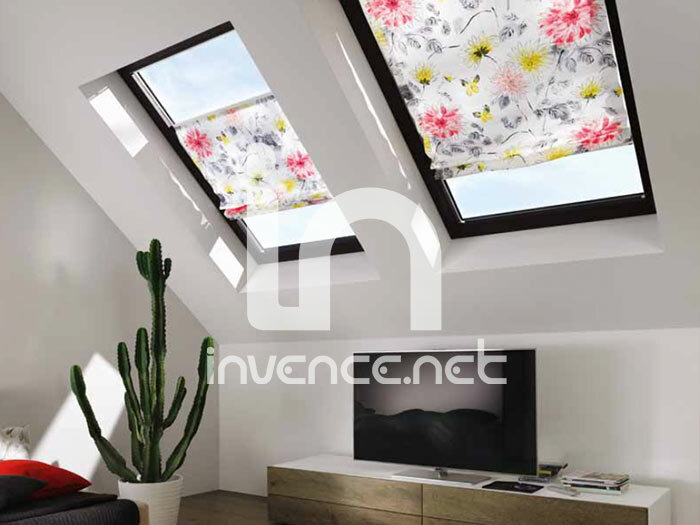 Due to the folded fabric and special wire construction plise can conceal even large studio windows or ceiling windows and conservatories. Plise can be controlled mechanically by dragging profile, crank or chain or with the integrated engine remotely. We offer more than 500 different kinds of substances translucence, patterns and colors. Substances may be completely obscuring. Plise also allow you to combine two substances - day and night. One substance with high penetration works through the day as curtain and decoration. Substance with low penetration can overshadow or completely obscure the interior. See our swatches substances of plise here. The system Duette is similar to plise to the sunroof. 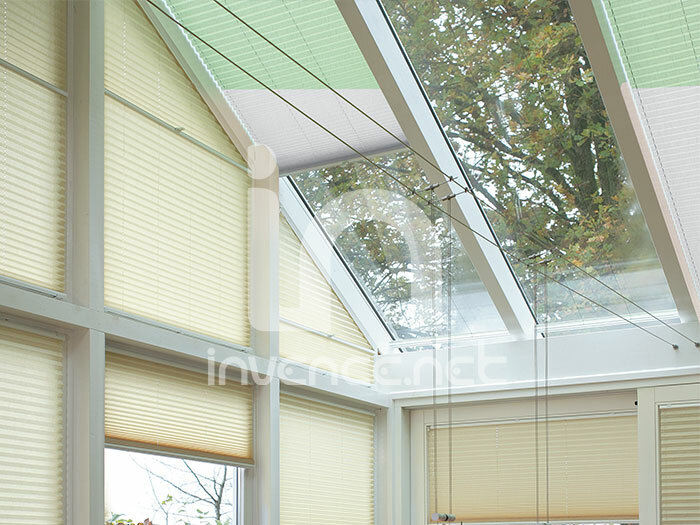 Duette is suitable for any sunroof and ceiling windows and glass surfaces. Thanks to a special chamber system Duette will prevent the penetration of heat into the room. The individual chambers can be provided with an inner aluminum layer which isolates very well. In the summer months it stops up to 78% of the heat which would pass into the room. In winter it can stop up to 46% of heat loss and saves you the cost of heating. We offer many different materials and colors. Duette can be controlled manually or mechanically. Duette system offers combination of two substances, a curtain and obscuring curtain. See our swatches substances Duette here.